South Gloucestershire Libraries are pleased to share An Adventurer’s Companion, a set of new resources. This marks the culmination of a three-year arts project funded by Arts Council England and delivered by the library service, which involved working closely with mental health and older people’s services within the council and the wider community. The project team took a creative approach to finding ways to improve wellbeing, reduce isolation and investigate how the arts can be used to explore library spaces in new ways. It was open to anyone experiencing mental health difficulties, including people living with dementia and their families and carers. Participants and artists considered things they thought you should never do in a library – and did them anyway! They created performances and audio tours showing new ways to discover and explore the libraries. Small scale artworks, short films, sound pieces, photography, poetry and textiles were all created as part of the project. An Adventurer’s Companion is designed to inspire anyone working with a group to help them explore their own creativity in new and surprising ways; it is particularly aimed at those supporting participants with low mood, depression or dementia, both in libraries and in any other setting. 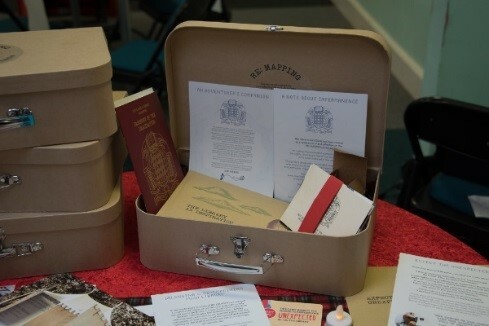 Artist Liz Clarke developed a physical travelling companion: a bespoke suitcase of exercises, resources, ideas and inspiration - which is available for groups to borrow from South Gloucestershire Libraries and use with their members. We want to share the resources beyond South Gloucestershire, so the case is accompanied by a website www.creativelibraries.org.uk where you can recreate the activities yourself and embark on your own journeys and adventures. An example is The Passport to the Imagination which has already been adopted by school nurses for use with teenagers experiencing low self-esteem. We hope that this material will inspire others across the country to improve their wellbeing through creative activities. For further information about the project, please contact arts.development@southglos.gov.uk. And to find out more about what is going on in libraries in South Gloucestershire, take a look at their website or follow them on twitter.